Synopsis: Nine-year-old Carrie Parker and her mother, Libby, are making a fresh start in the small town of Hartsville, North Carolina, ready to put their turbulent past behind them. Violence has shattered their family and left Libby nearly unable to cope. And while Carrie once took comfort in her beloved sister, Emma, her mother has now forbidden even the mention of her name. My Review: I really liked this book. I have to admit, I struggled with the first 40 pages and after that....I couldn't put it down. Carrie just pulled me in the story so deeply. I couldn't let go of her. I really wanted to dislike Libby, but I think she just needed help and never received it. When Carrie meets the Chaplins...oh my heart just couldn't believe it. I loved how they took her in and all the "first/new" things Carrie experiences. SPOILER ALERT: Most of all, I loved how they all save each other. What Happened to my Sister really moved me and is one of those books that will just stay with me (in a good way) for a very long time. Lets not forget the Chaplin family. I liked how we learn about the Chaplin family from different narrators. I made some terrible assumptions, which didn't pan out in the book. I totally love what unravels and should be a lesson to us all, not to jump to conclusions. I just found out today (yeah, not sure how I missed it either), that What Happened to my Sister is a follow up to Me & Emma. I know other bloggers are suggesting that you read Me & Emma before reading What Happened to my Sister. Given I didn't even know there was a "first" book out there, I don't think you do need to read them in order. However, I can't wait to read Me & Emma. Also, I believe it might have set the story up more for me (remember those first 40 pages I struggled with), if I had read Me & Emma first. Do I think you must read Emma & Me first - absolutely not. What Happened to my Sister is a great book all on its own. What Happened to my Sister is a really good read and I recommend that you purchase it today (chance to win a copy below!!). Meet the Author: New York Times bestselling author Elizabeth Flock is a former journalist who reported for Time and People magazines and worked as an on-air correspondent for CBS. She is the author of several acclaimed novels, including But Inside I’m Screaming and Me & Emma. She lives in New York City. Connect with Elizabeth Flock on Facebook, her website, and on Goodreads. Purchase: You can purchase What Happened to my Sister online at Amazon for $15.00 ($10.20 prime members and $9.99 Kindle version). Win it! 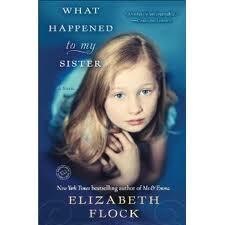 : I am so excited to let you know that one lucky participant will win a copy of What Happened to my Sister. All you have to do is complete the form below. Contest ends August 22nd, midnight EST. Good Luck! TLC Book Tours: Check out the other raving reviews of What Happened to my Sister at TLC Book Tours. Sounds like a captivating story. I liked your review and it is good to know it may take a little bit to get into the book. Thanks for sharing and for the giveaway. I love the WWII story/movie "The Way We Were" with Robert Redford and Barbra Streisand. I loved the book Bridge of Scarlet Leaves by Kristina McMorris, amazing WWII story! I loved The Language of Flowers by Vanessa Diffenbaugh. I think my favorite memoir is 'Just Kids' by Patti Smith. She pretty much pulled me over to the memoir genre.